A National Trust property since 1985, Kedleston Hall is a breathtaking 18th Century Mansion set within beautiful parkland. Designed specifically for entertaining guests in an opulent and lavish environment and for housing an astonishing collection of art, Kedleston is a truly remarkable place. The Curzon family have lived on the Estate since 1297 and the present house was commissioned in 1759, meaning that the Hall showcases works collected by the Curzon family over many centuries. When you enter the Hall, take a moment to admire the neoclassical architecture of the interior. On entering the house through the North portico you will notice the marble hall straight away. Designed to resemble the open courtyard of a Roman villa, the ceiling is supported by 20 fluted columns. This makes for a highly impressive sight. As you make your way through the house, you will notice in particular the Venetian window in the drawing room and the dome-shaped vaulted ceiling in the dining room. You will feel as though you’ve stepped back in time and are walking through the magical splendours of classical revival. Once you’ve stepped out of the surreal design of the Hall’s interior, the gardens and grounds serve as a welcome return to reality. Keep an eye out for the numerous follies and temples built by Robert Adam as they are little reflections on the Hall’s theme. The North Lodge, for example, is designed much like a triumphal arch. The Fishing Room, situated by the lake, is by far the most noticeable of these structures and is definitely worth looking at. 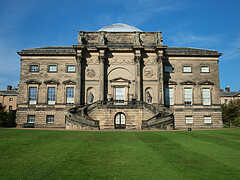 Kedleston Hall has so much to offer in the way of rich and vibrant history that it is a delightful place to visit. 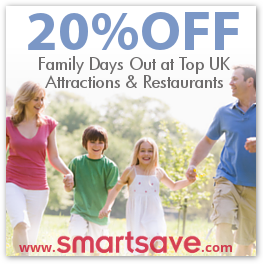 Whatever you want from a day out, it will not be disappointing. Opening Times: House 12pm-5pm, Garden & Park 10am-6pm, Shop & Restaurant 11am-5pm. Please see website for seasonal alterations.